Yeah. It’s that post. The one where I look back on everything I did last year, bemoan the things I didn’t do, and resolve to get in gear during the coming year. Even if all of the bookmarks are counted as one object, that’s still nearly two finished objects per month. That’s not too bad, if I do say so myself. The 2006 FO list has been removed from the sidebar, and a new list and new gallery for 2007 have been started. Nothing in them yet, but I’m working on it. There are unfinished objects over in the sidebar. Sadly enough, a couple of them were unfinished last year at this time. But since both are items that I’d really like to have, I will keep slogging away at them. 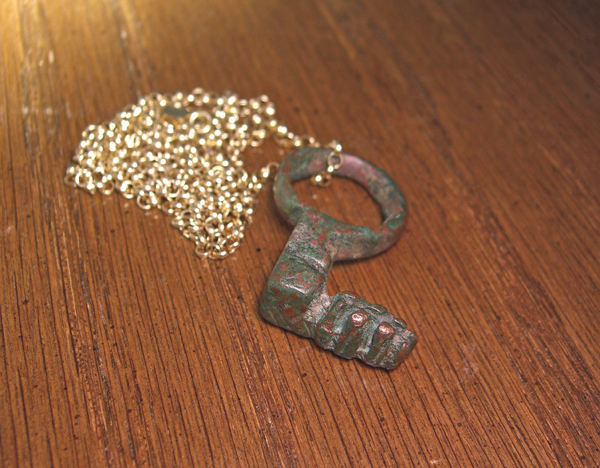 This is a bronze Roman key, made sometime in the 1st to 3rd centuries AD (or CE). It was most likely made to fit a small chest or casket that stored valuables. Who was it that used this key? Did it belong to a woman? The wife of a merchant? The daughter of a general? Did the casket break and the key was thrown away? Was it lost and searched for but never found? What secrets and treasures did the little chest guard? Jewelry? The spices of the Orient? Important papers? Plots against the emperor? (several of the more interesting ones fall in that time period) Plans for conquering the rest of the known world? A precious book? Let’s go back 2000 years and use this key… unlock the chest… peak inside… what do you see? The key is strung on a chain because I am wearing it as a pendant to remind myself that things that are locked away and hidden may be safe, but they are also not of much immediate use. This year I resolve to look for hidden treasures to be unlocked.